Speak to anybody about which Central and South American countries they have heard of and Peru and Brazil will always be in the top five. These are iconic countries. Peru, culturally fascinating, with Machu Picchu their jewel; Brazil with the stunning Iguacu falls and of course Rio de Janeiro. Even those of us who have visited both countries - would never turn down the thrill of visiting again and again. The two countries can be easily combined and are very different although they border each other. Spanish is the official language in Peru, Portuguese in Brazil. Brazil is 7 times larger than Peru with an area of 8.516 million square kilometres; Peru known for its culture and Brazil for its physical diversity. In this very good value 13 night itinerary featuring the splendours of Peru and Brazil we have concentrated on the ‘must see’ sites in each country, hoping to capture your interest in South America and therefore prompting you to explore further on future visits. The itinerary is based on three and four star hotels. For a deluxe experience, Belmond Hotels have properties in every destination featured in this itinerary. They include the legendary Copacabana Palace Hotel in Rio and the Das Cataratas Hotel in Iguacu. On arrival at Jorge Chavez International Airport in Lima, private transfer (approximately 50 minutes) to Crowne Plaza Hotel for 2 nights on a bed and breakfast basis. Overnight at the Crowne Plaza Hotel. After breakfast join a private half day guided tour of Lima. Lima is the capital and largest city in Peru, with a population of just under 10 million. It was founded by the Spanish conquistador Francisco Pizarro in 1535. This bustling city slopes from the shores of the Pacific Ocean into valleys and mountains as high as 1,550 metres. It has a mild desert climate. The historic centre is a UNESCO World Heritage Site. Your afternoon is at leisure to explore or relax. We thoroughly recommend some time spent in the historic centre with its churches, monasteries and mansions. Don’t forget the restaurants around your hotel for dinner! 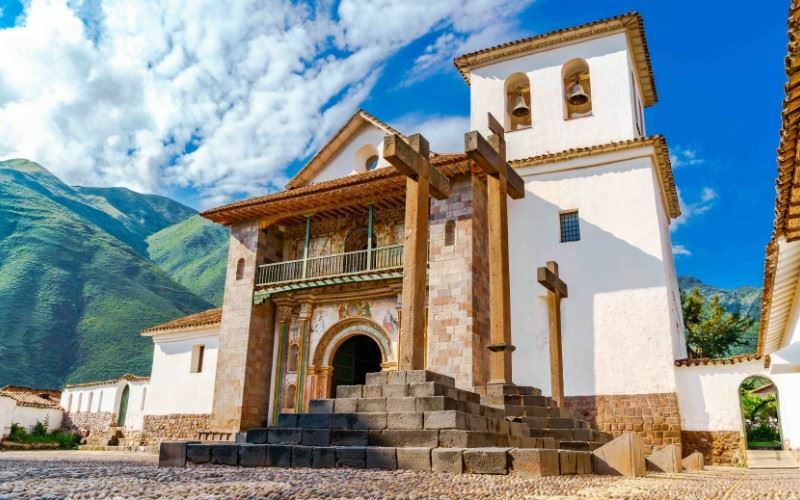 After breakfast a private transfer to the airport for your flight to Cusco and then on by private car to Urubamba within the ‘Sacred Valley’ and 2,871 metres above sea level. From there a visit to the Pisac Sunday market, one of the most famous in the Cusco region where many indigenous Quechua come to Pisac to sell their produce. Following the market visit, on to the spectacular Inca fortress site at Ollantaytambo (2,792 metres above sea level). The ruins are set amid snow capped mountains above the Urubamba River. Overnight is at the three star Pakaritampu Hotel on a bed and breakfast basis which is around 600 metres from the fortress ruins and from the main square of Ollantaytambo village. The train station is a 3 minute walk from the hotel. Interestingly, the village’s old town is set out in an Inca grid of cobblestoned streets and adobe buildings. Overnight at the Pakaritampu Hotel. After breakfast walk to the station for the train journey to Machu Picchu (tickets included). Private guided tour of the site. Group shuttle bus to the site and lunch included. Machu Picchu, a 15th century Inca citadel is a UNESCO World Heritage Site and is set amongst spectacular mountain scenery 2,430 metres above sea level. Interestingly, Machu Picchu was abandoned by the Incas in 1550 at the time of the Spanish conquest but was never discovered by them. The site was unknown to the outside world until 1911. Like the Iguacu falls, Machu Picchu must rank as one of the wonders of the world. Following the site visit, transfer to the El Mapi Hotel for an overnight stay on half board. Overnight at the El Mapi Hotel. One needs to see the Machu Picchu citadel in the morning light so we have included entrance tickets for a second independent visit to the site (no guided included). in the afternoon group shuttle bus back to Aguas Calientes (walk to the station and assistance with luggage). Board the train for the journey to Poroy, approximately 40 minutes from the historical centre of Cusco. Private transfer from Poroy to the El Mercado Hotel for 3 nights on a bed and breakfast basis. Overnight at the El Mercado Hotel. After breakfast, embark on a private half day guided tour of Cusco and Sacsayhuaman, both UNESCO World Heritage sites. Cusco, the ninth highest city in the world at 3,400 metres and with a population of around 400,000 was once capital of the Inca Empire. The city was founded by the conquistador Pizarro in 1533 and the fascinating historical centre is now largely Spanish colonial but some Inca foundations still remain. Sacsayhuaman on the northern outskirts of the city and at 3,701 metres above sea level is a citadel originally constructed by the Killke culture in 1100 and then expanded by the Incas in the 13th century. The walls of the citadel represent the ultimate in dry stone walls, constructed with huge boulders beautifully fitted together. Your afternoon is free to explore the historical centre. There are many excellent restaurants in Cusco so be bold and try the local cuisine. You have a free day in Cusco today and we cannot think of a better place to be! After breakfast private transfer to Cusco Airport for your flight to Lima and then an onward connecting flight to Iguacu in Brazil (approximately 7 hours 30 minutes) and then a private transfer to the 4 star Vivaz Cataratas Hotel and Resort for 3 nights on a bed and breakfast basis. With an outdoor pool, very pleasant gardens and friendly staff, the hotel is located in the town of Foz do Iguacu and is a very good base from which to visit the falls. Overnight at the Vivaz Cataratas Hotel and Resort. After breakfast full day private guided tour (including lunch) of both the Argentinian and Brazilian side of the falls. Set in the Misiones Province of Argentina and the Brazilian state of Parana, these falls are one of the greatest spectacles on earth. The Iguazu Falls defy description - they simply have to be visited. This is the largest waterfall system in the world. The longest waterfall drop is 82 metres. There are 275 individual waterfalls over a total width of 1.7 miles. For those who are interested in the fate of the 16th century Jesuit missions in the Misiones province of Argentina, there is an excellent film called ‘The Mission’ starring Jeremy Irons, Robert De Niro and the Iguazu falls of course, with a magnificent soundtrack by Ennio Morricone of ‘The Good The Bad and The Ugly’ fame. Day at leisure to view the Brazilian side of the falls once more and to relax by the hotel pool and explore the gardens. There is a good range of activities available locally. After breakfast private transfer to the airport to fly to Rio de Janeiro (approximately 2 hours) and then private transfer to the 4 star Porto Bay Rio Internacional Hotel for 3 nights on a bed and breakfast basis. The Porto Bay is located in front of Copacabana Beach with a rooftop pool and terrace on the 20th floor with panoramic views of the bay and Rio. After breakfast, a full day private guided tour of Rio (lunch included) and all entrance fees including highlights like the Selaron Steps, Rio Cathedral, the Corcovado mountain with the statue of Christ the Redeemer, cable car to Sugarloaf Mountain, the beaches of Ipanema and Copacabana, an outside look at the Maracana Stadium and much more. A day at leisure in one of the most exciting cities in the world. Stroll on Copacabana Beach, relax by the hotel’s pool and don’t forget a visit to the famous Rio Botanical Gardens. Founded by King John VI of Portugal in 1808 and originally intended for the cultivation of spices such as nutmeg, pepper and cinnamon, the gardens were opened to the public in 1822. The gardens, covering 140 hectares are located at the foot of Corcovado Mountain and show the diversity of Brazilian and foreign flora. 6,500 species are to be found within an area of 54 hectares (40% of the park is cultivated, the rest being Atlantic Forest rising up the slopes of Corcovado) and numerous greenhouses are also to be found. There are also 140 species of birds which, having become accustomed to humans, are easier to spot than in the wild. Capuchin monkeys and tuft-eared marmosets can also be spotted. An evening transfer to Rio Airport for your return flight back to the UK or, if you are looking for a lively, zany and very Brazilian seaside resort why not have a few nights in Buzios (approximately 4 hours by car) which was a favourite of Brigitte Bardot and where her statue adorns the harbourfront. Located close to the bridge linking Brazil with Argentina and a 10 minute drive from the Brazilian side of the falls, this modern resort hotel is conveniently located next to an aqua park and local golf course. The hotel amenities include two restaurants, a bar, a swimming pool, games room, gym, spa, tennis court, children's play area and kids club. Good for families. 170 air-conditioned rooms, including single rooms, standard rooms, deluxe rooms, triple rooms, quadruple rooms and deluxe suites.